When you add your name to the Farmgirl Sisterhood list, you’ll receive a consecutive number according to when you signed up (for example, Farmgirl Sisterhood Member #750). Once you’re officially signed up (see below), we’ll mail your official Farmgirl Sisterhood badge depicting an adorable aproned hen, our official logo, ready to wear or embroider, and an official Farmgirl Sisterhood certificate signed by the Queen Bee herself. We also offer for purchase a Sisterhood necklace customized with your unique number. 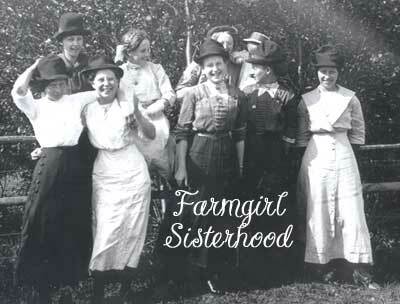 Over on the Farmgirl Connection chatroom, you’ll get a special hexagonal Farmgirl Sisterhood designation by your name. In addition, you’ll start receiving our 70-page bimonthly e-mail newsletter called the “Sister Issue” packed with project ideas, news, and tips; you’ll be eligible for “Members Only” special product offers from MaryJanesFarm; and you can start earning Farmgirl Sisterhood Merit Badges right away (think Girl Scouts for grown-ups) and post photos and narratives of your projects on our website (braggin’ rights). In other words, you’ll be strutting your farmgirl skills for all the world to see! (More info on Merit Badges below.) Members are also the only ones permitted to mentor Farmerettes (farmgirls-in-training between the ages 14–18) and Young Cultivators (girls and boys between the ages 6–13) and work with them to earn badges. But if you’re not inclined to earn Merit Badges, there are plenty of other benefits to joining up. Whether it’s cooking, stitching, gardening, make-it-yourself projects, going green, cleaning up, or just getting together, you’ll gather with other farmgirls for lots of fun! Now, mind you, Henrietta takes her noble position seriously, so she’s decided she wants some rules about how she will be seen in the world. She wants to make sure her sacred position representing the nobility of the true-blue, dyed-in-the-wool, birds-of-a-feather Farmgirl Sisterhood member won’t be muddied through misuse by those who have a lesser “understanding” or command of honorable farmgirl traits. Henrietta wants to make sure that when Farmgirl Sisters are out-and-about in the world and they see someone with a “Henrietta” logo on her jacket or bag, that she’s the real McCoy. In order to join the Farmgirl Sisterhood, you must first register as a farmgirl on our Farmgirl Connection chatroom. It’s free to register. Just follow the links. Once you’re registered, you can then purchase your annual Sisterhood membership for $20. Members will be notified by e-mail or postcard when their year’s membership is about to expire. (If their membership lapses, they’ll lose “their” unique number!) To renew, click here. MaryJane’s Farmgirl Sisterhood and Farmgirl Sisterhood logo depicting our “Henrietta” hen in an apron are trademarks that are owned and copyrighted by MaryJanesFarm. Unauthorized usage of the logo by any person or group will be subject to the full extent of prosecution under the law. Please read: Rules for Farmgirl Sisterhood Membership and Using the Farmgirl Sisterhood Henrietta Logo. Become an Official Farmgirl Sisterhood member today! Renew your Farmgirl Sisterhood membership! What’s the difference between the Farmgirl Chapter groups and the Farmgirl Sisterhood? There is no charge to start or join a Farmgirl Chapter, to swap it up on our Farmgirl Barter, or to chat online with other farmgirls. However, to wear the official Henrietta logo, to participate in the Merit Badge program, and to access other benefits, there is an annual $20 membership fee to belong to the Farmgirl Sisterhood. The hexagon, a shape that speaks the zen of the busy beehive or the wired manors of chickens (the oldest domesticated animal on Earth), symbolizes the unity and structure of the farmgirl life—a framework for the proper order of things, a pattern for life. In unwritten feminine language, it is a standard for farmgirls, or for that matter, the ordinary honeybee or the hen, rank and file workers that move the work along. It says that all things are to be done decently and in order, and that small things add up. We call our hen “Henrietta.” She symbolizes the “can do” attitude of being a farmgirl. What are the noble farmgirl traits? Farmgirls are multi-talented, resourceful, creative, strong, down-to-earth, and generous by nature. We enjoy creating things, whether it is in the kitchen, our studios, or the wood shop. We may not live in the country, but friendship, fun, community, and creativity bloom wherever we happen to be “planted.” In other words, farmgirls can do anything they set their minds to, sorta’ like the Little Red Hen in the famous children’s story. We enjoy the fun of getting together to create, to help others in our communities, or to share ideas. We believe in the power of the Farmgirl Sisterhood to change the world for the better! Since MaryJane has been “aproned” her entire life, it’s only fitting that our Henrietta hen put on an apron. MaryJane’s mother, a woman of many aprons, taught her that an apron is the universal symbol for a grown-up girl’s 4-H program (“home,” “hearth,” “handiwork,” and “hogs”). So, a woman who means business (and has work to do) is never without one! What are Farmgirl Merit Badges, and how do I earn them? Another benefit of becoming a Sisterhood member is the ability to earn Merit Badges. The seven sections in my Ideabook, Cookbook, Lifebook cover, I think, most aspects of a farmgirl’s life: Each Other, Farm Kitchen, Garden Gate, Stitching Room, Make It Easy, Outpost, and Cleaning Up. Our Merit Badge structure grew from those seven sections. You earn Merit Badges in any of those sections by doing tasks in categories like crocheting, community service, going green, etc. You name it, a farmgirl can do it! Everything from engine overhaul to doily construction! The badges to be earned will evolve as new members join and add their interests to the mix. Each category has three different levels: Beginner, Intermediate, and Expert. See a detailed list of categories for each section. To find out how to apply for your badges, read more about them here. How will I know when Merit Badges have been updated, or when new ones have been added? For those of you who keep track of the Merit Badges for your own records, we maintain a log of changes made, here for regular Sisterhood or Farmerette badges, or here for Young Cultivator badges. Any updates or additions to the Merit Badges will be announced on the chatroom in the “Farmgirl Sisterhood” section. Farmerettes are young farmgirls-in-training between the ages 14–18. They can earn the same Merit Badges as adult Sisters, so long as there is a Farmgirl Sisterhood member nearby to work with them. Young Cultivators are girls and boys between the ages 6–13. They can work with Farmgirl Sisterhood members to earn badges, but have their own unique program. Learn more about Young Cultivators here. Will we ever have get-togethers in different parts of the country to meet each other in person? Absolutely! In fact, farmgirls have already been getting together—touring, trailer camping, and connecting cross-country as Glampers on the Loose (they even have a logo: get it here!) and as Farmgirl Chapters, getting together to craft, show off badges, and share stories. Come join in the fun, hen and cackle style! 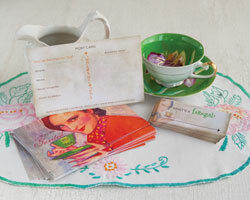 ... to tea when you join our Farmgirl Sisterhood. Along with all the other privileges and specials just for Sisters, you’ll be able to request these adorable tea party postcard invitations and name tags. (The invitations list where, when, what to wear, and what to bring.) But you have to promise to send us photos of your tea party! To request your invitations, send an email to farmgirlsisterhood@maryjanesfarm.org stating your Sisterhood #, mailing address, and how many invitations you need.